I should have posted this in March, but better late than never. Hermann Ringel's birth record shows he was born November 5, 1885 in Berlin, that his parents were Schija Ringel and Feigel Kaufler. Kaufler was Ringel's unmarried Jewish housekeeper. A notation on the birth record from two and a half years later indicates that Schija and Feigel married on July 2, 1888. 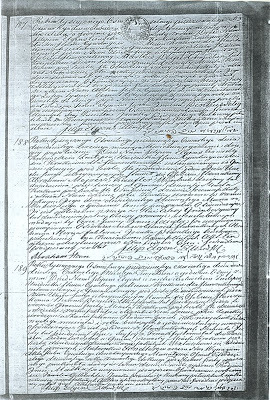 Feigel's death certificate from November 28, 1921 (three years before her granddaughter Helga's birth), describes her as 67 years old, a shopkeeper, born in Krakow and residing at the same address in Lothringstrasse as her son Hermann. Hermann's death record from June 25, 1938 is pretty spare, and does not appear to tell us anything new. The right name, location and year. Photocopies can be obtained from a collection in Israel, and I sent in an order. Yay! This is the first time one of our names has matched someone else's family tree. After my nice find of Schija Ringel's family in Rzeszow, I thought I would see what more I could dig up on the Kauflers of Krakow. As noted from a few days ago, I had already found the birth record for Feigla Kaufler. This time I did an ordinary Google search on kaufler, and, lo and behold, I hit the mother lode. A gentleman named Dan Hirschberg has done a tremendous service by compiling extensive family trees for 600 Jewish families from Krakow, including the Kauflers. According to Hirschberg's research, the family name goes back to a Nachman Kaufler, born 1755. Yes, 1755. That is as far back as we have traced any branch of our family. 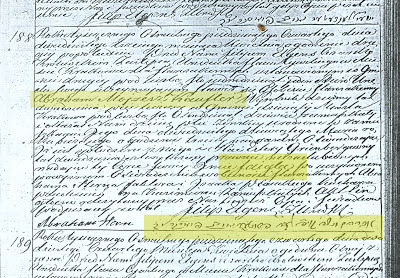 Nachman's son Izaak (born between 1771 and 1775) married Beili (1773-1831, daughter of Abraham, last name unknown) and they had a son Schulim (1798-1847). Schulim married Reisel Bluma Singlust (born 1805-1877) and they parented Abraham Mojzesa Kaufler (b. 1829). Hang in a little longer. Abraham married Chaja Ester Grunberg (b. 1825) and the second of their three children was our great grandmother Feigla. I'm very far behind in blogging. A lot has happened that I will try to fill in while I begin to catch up. One angle is that I have begun to order facsimile documents of existing vital records where available. The first of these has arrived: It is the Polish language document from 1854 that records the birth in Krakow of Feigla Kaufler, the mother of our grandfather Hermann Ringel. I'll do my best to display the document in the confines of this blog. Here is a view of an entire ledger page that includes three birth records. Feigla's is the second entry, number 188. Most of the text is indecipherable (to me, and so far), but this close up highlights some of the interesting parts. Here are the four detail sections. The first is the name of Feigla's father Abraham Mojzesa Kaugler. Then her mother's maiden name, Chaya Esther Grunberg. Then her given name, Feigla. Finally, I have included the Hebrew transcription that appears at the bottom of the record, beneath the official signature. Any of our Hebrew speakers want to take a crack at translating that? Our next step is to get a full translation and I have begun to investigate Polish document translation services. I plan to send in a scan and ask for an estimate. I hope it is not too much because it is very likely that I'll soon have similar birth records for all of Feigla's siblings and other family members. These are all on order from the LDS research center in Salt Lake City, and should be available to me soon at the Oakland branch.